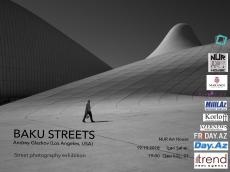 A photo exhibition of Andrey Glazkov "Baku streets" will open at Nur Art House Gallery on October 19. Through his work, the photographer presents his view on the City of Winds, Trend Life reported. Andrey Glazkov is a travel photographer who has visited many countries in search of inspiration and images. He currently lives and works in Los Angeles. The main direction in his photo art are street portrait and photography. His works are characterized by fragmentation and extraordinary focus. His photographs have repeatedly won at various international competitions. At the beginning of the summer, Andrey Glazkov arrived in Baku. This is how his collection of photos dedicated to Azerbaijan appeared. As the photo author said, the collection will be included in a photo project called the Caucasus. One of the works of the photographer, dedicated to Baku, has already been published in the prestigious network photo gallery Leica. "I don’t ask people to pose for me on the street. All shots should be spontaneous. Of course, when I shoot models, everything is different, but in street photography I don’t accept performances. And I don’t like to take pictures of everyone," said Glazkov. "If I shoot people, it’s more than just a face. This is a situation. This is a story. This is a moment, and a person is part of it, but not the only participant in the frame," the photographer said. Within the exhibition, Andrey Glazkov will meet with young Azerbaijani photographers. A creative discussion on the themes of "Street photography" and "Leica Optics and modern photography" will be also held as part of the event. The curator of the exhibition is Vadim Mansurov. The event starts at 19:00. Admission is free. Media partners of the event are Azernews.az, Trend.az, Day.az, Milli.az, Friday.az.